Mandalas allow us to meditate on the subject. The installation invites viewers to examine many facets of the work, including the transference of ritual to the domain of art, and the nature of the relationship shared by money and art. 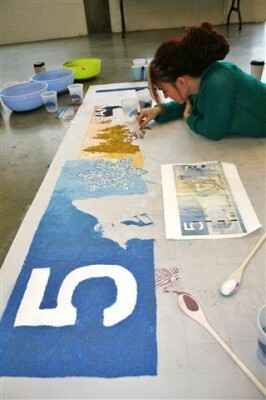 Each mandala depicted the currencies of the countries and contexts in which they were created. While producing the labour intensive sand dollars I interacted with audiences, discussing the transient nature of money, art and material goods in our societies. The sites I worked at ranged from Beirut to the Vancouver 2010 Winter Olympic Games. 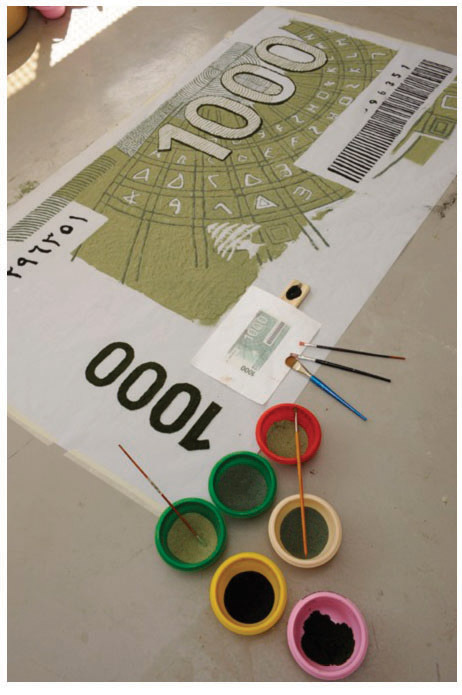 Many viewers remarked they had never thought about what was pictured on money. At the Olympics many Canadians admitted to not previously noticing the illustration of the hockey game on their $5. Viewers returned many times over the creation of the mandalas to observe progress, show friends and offer further thoughts. Occasionally local artists offered to help, rolling up their sleeves and enjoying the lively conversations with viewers.